The Little Crooked Cottage : Mr. Pig LIVE . . . with Little Elliot! Mr. 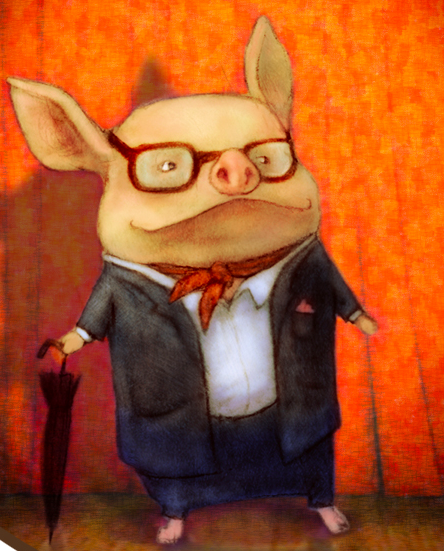 Pig LIVE . . . with Little Elliot! Are the cupcakes ready? Yes?... What?! We're on the air? OH! 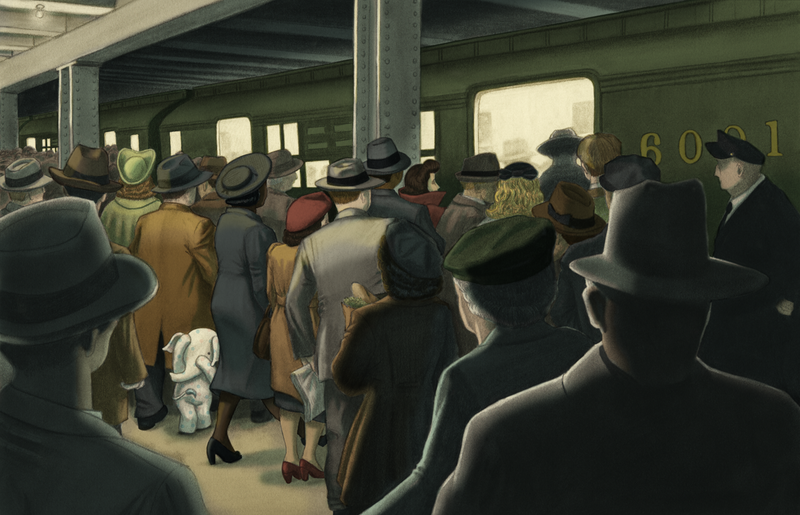 Elliot leads a quiet life in the big city. 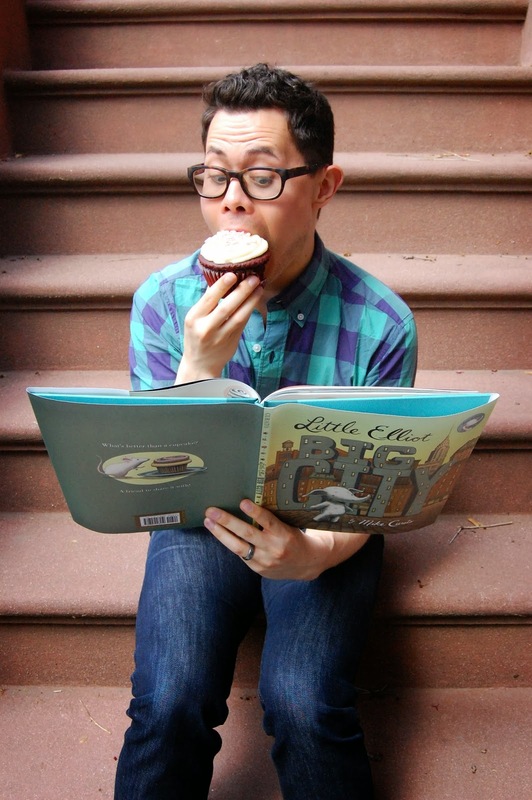 But in spite of the challenges he faces, Elliot finds many wonderful things to enjoy—like cupcakes! And when his problems seem insurmountable, Elliot discovers something even sweeter—a friend. Hello, Mr. Pig. Happy to be here. Let's start right in with the tough questions. Do you have a belly button? I have a belly dot (a few of them). Does that count? Um, I think so. What is the best thing about being you? I’m different in many ways. I haven’t met anyone like me, and I think that is special. I like being me! We like you, too! What is the worst thing about being you? Sometimes it’s hard for me to get at things, like when they’re up high and I can’t reach. But I can be creative. Oh, um, I don’t wear pants. Oh my! Silly me. Let's move on. What is your most embarrassing moment? I think just now when I realized that I’m naked! My apologies. What is your idea of the perfect day? I would read a book and make a drawing. Then Mouse and I would take a walk in the park. 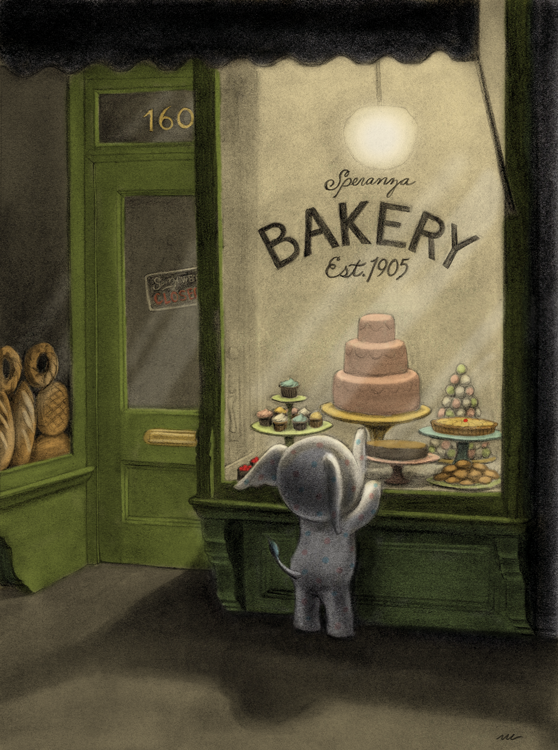 Then we would go to the bakery, and the lady would notice me right away and say, “Hello, Elliot! What kind of cupcake would you like today?” And I would say “double chocolate, please!”... or maybe red velvet. And then Mouse and I would go home and share it. Ah, yes. We have a lovely bakery in the Enchanted Woods. Do you know the Muffin Man? Lovely fellow. So, what is your favorite word? From Little Elliot, Big City. Illustration copyright 2014 by Mike Curato. Tell us your favorite sound. My favorite sound is the bell that rings when I open the bakery door: dingalingalingaling... It always makes me smile. Indeed. If you could dine with three characters from other books, who would they be? I want to have lunch with Ulysses from Flora & Ulysses. I have never met a flying squirrel before. I want to pet his tail. I would also invite Louise from Louise Loves Art. I think that she is a good artist. She can make a picture of all of us! I would also invite Henny from Henny. She is different from other chickens, just like I am different from other elephants. Maybe Ulysses can teach her how to fly. Or at least write a poem about flying, and Louise could illustrate it. We would have donuts because Ulysses has special dietary needs. I think this would be a good lunch. Louise was a guest on my show. She's delightful! Next question. Do you have a pet peeve? What is a peeve? I don’t have any pets. Would a peeve make a good pet? Is it smaller than me? I would take good care of it. I think I would name it Petey Peeve. Many people think that I only like cupcakes, but I like other things too, like ice cream, and spaghetti, and eggs, and peanut butter, and Brussels sprouts, and pizza, and just regular cake. I know it is surprising that I like Brussels sprouts, but they are like polka dots for your plate. You make Brussels sprouts sound fun. Speaking of fun, what are you reading right now? I am reading The One and Only Ivan by Katherine Applegate. I have never met a gorilla, but Ivan sounds like he’d be a good friend to a little elephant like me. I wish that I could make music with my trunk, like it was a trumpet. It sort of sounds like one now, but it needs a tune up. What was it like working with Mike Curato? I like working with him because he always has cupcakes around. Usually, when I’m talking to him, he is eating one and just nodding a lot. He calls it “research.” I think Mister Curato is a very good researcher. Thank you, Little Elliot! We have a sweet treat for you, too -- a snack made especially for YOU by Nina at Lunches with Love. Enjoy! Mike Curato is an author and illustrator who loves small treasures. 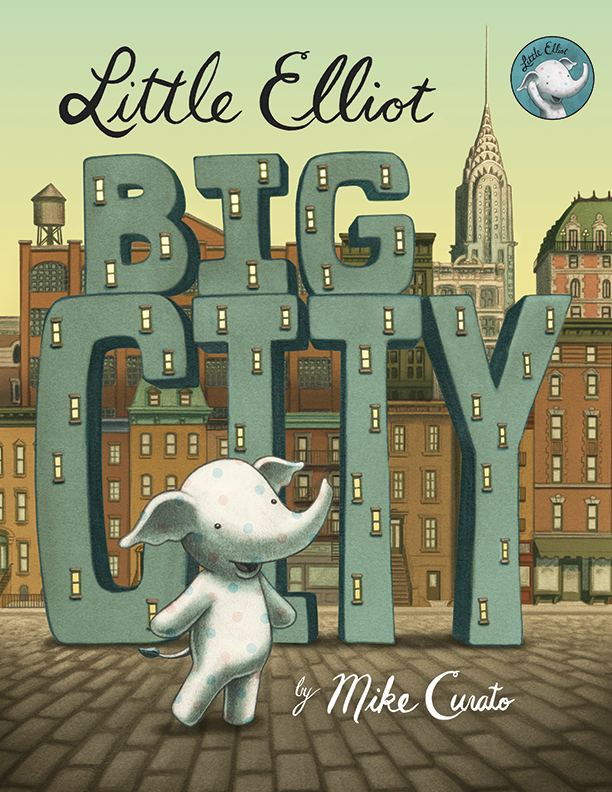 His debut picture book Little Elliot, Big City is first in a series of three. It has received starred reviews from Publishers Weekly and Booklist. You can find him on any given day walking around the city eating a cupcake (or thinking about it). For more info about Mike, visit his website. Thanks for commenting, Jess! Petey Peeve . . . hee hee. We smell a picture book there. Loved the interview. I hope to have some interviews lined up for T.A.A. in 2015. I reviewed Elliot's book recently and thoroughly enjoyed it, so much so I made this fan book trailer! I made it before I realized it had a book trailer already. It's really good but I think mine's nearly as good. I hope Elliot likes it if he sees it. Like Elliot, I love spaghetti and Brussels sprouts, too, the key is roasting them if your not a rabbit who'd like them raw, at least the rabbits I know... Of course, loving cupcakes are a given for me as well. Thanks for that fun interview, Mike is very entertaining!